Deer, Green Heron, Wood Ducks. Linocut Proof by Ken Januski. 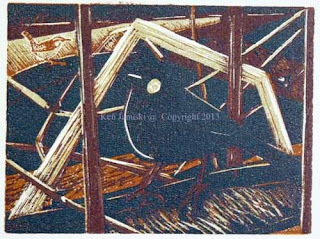 After the last very complex lino/woodcut I felt like looking at the work of some other wildlife artists working in print. Out popped Wildlife in Printmaking , by Carry Akroyd from Langford Press. I've read it a number of times since receiving it as a present at the end of last year. 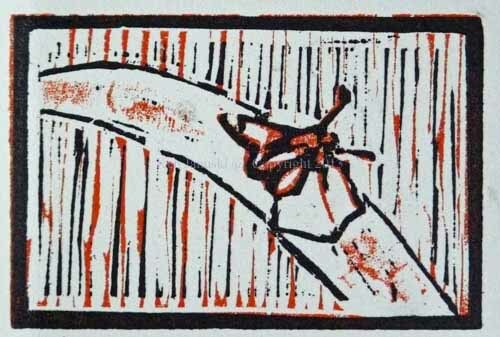 One of the most common themes is that many if not most of the artists represented chose printmaking as their medium because they like the element of surprise in it. That really rings true to my experience. Though I don't think any of the artists in that book use this exact phrase printmaking forces you into a dialog with the print. That is much of its appeal. Who knows why. You'd think that an artist would like to be in total control. But it's the element of surprise I think constantly thrown up by the process that keeps it interesting. In any case I did do a bit of planning on the first proof of a linocut at top. 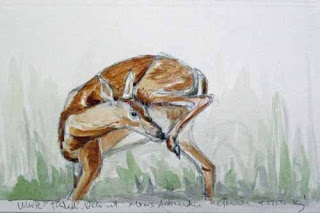 I did this partially because I've never drawn or painted deer of any sort, or really any mammals. 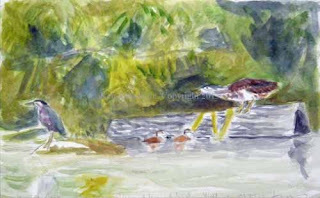 So I did a watercolor study of it below, another of the Green Heron and Wood Ducks also below, and then a wash watercolor above trying to get some idea of a composition that would work and include all of these characters. The lino is based on the wash watercolor, though its initial inspiration came from the Conte sketch of the last post. What is That Duck Looking At? White-tailed Deer, Green Heron and Wood Duck at Morris Arboretum. Conte Sketch by Ken Januski. About a week ago I was birding and sketching at the wetlands of Morris Arboretum, hoping to find some of the migrants that I've often found in previous Augusts. I had my scope with me to help with the sketching. At one point I saw a Wood Duck and then noticed a Green Heron next to her. But why was the neck of the duck stretched, gawking at something to the left? Then I noticed the Green Heron was looking that way too. I couldn't see anything. Later however when I was over on that side of the pond I found a White-tailed Deer, something we see occasionally there but really not that often. I didn't see him until 15-30 minutes after seeing the gawking birds. But he was in a similar direction and various small islands would have blocked an earlier view of him. As soon as I put this all together I also put together an image for potential painting or print. Above is a 9x12 Conte sketch in Stillman and Birn's Gamma sketchbook. I thought about various media for this study and did a few preliminary pencil sketches. I chose Conte, largely because I've found that it forces me to simplify, to get a better sense of the mass and gesture and not worry about detail. 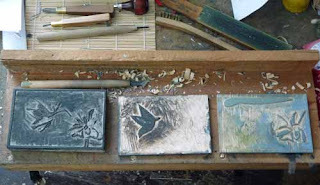 That's pretty much the method I used in the Yellow-bellied Sapsucker Conte sketches that were the basis for a lino/woodcut a month or two ago. So that's sort of my idea here. However I rarely draw or paint deer. This will be something new for me. But I'm in an experimental mood so I may just give this a try as a small linocut and or woodcut. My reduction linocuts take a very long time to do and can be quite exhausting. Out of curiosity I checked on the hours spent on them and they average between 40 and 60, not counting the many hours spent trying to decide on a subject. After the last couple of reduction linocuts I vowed to do something simple but still ended up getting involved with complicated, time-consuming linos and/or woodcuts. Not today. 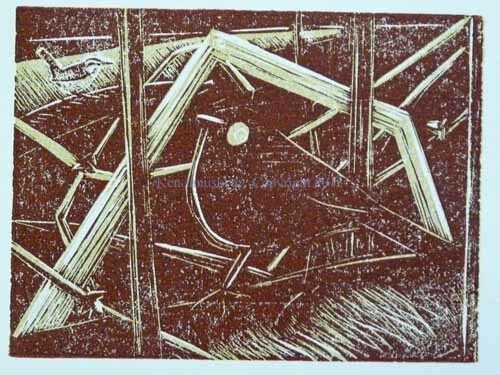 The two-block woodcut immediately above took 3.5 hours from the first cut in the block to the final cleanup. It's not exactly what I envisioned but I wanted to do something simple and I wanted to try a grab bag of Shina plywood cutoffs that I received a week or two ago. This print, done on leftover Rives Heavyweight paper, is about 4x5.5 inches. I printed and hand-colored it in an edition of 5. Along with dragonflies Jerene and I have continued to develop our interest in butterflies. One that we see quite often is the Zabulon, pictured above. The colors really should be orange and brown not red and black. Still I think it gives an approximation of the butterfly. When I started it I thought about just doing a one color print in black and then hand-coloring the prints with watercolors as I did with my Osprey at Cape May lino. But I just couldn't resist trying to get the orange by carving the butterfly on the reverse side of the black woodcut. Of course that's not really very orange. But I might just try some watercolor and see what happens. 24 hours later and I realized that I just wasn't happy with the colors in this. So I added a touch of watercolor to one of the five prints I pulled. It's at top. It looks better but still not as good as I'd like. I may eventually redo this as a slightly more finished print. I will keep it slight though as I'd like it to stay fun. Speaking of fun that is generally my experience in observing nature, especially birds. That's not always the case in situations where the weather might be miserable for instance. But normally it is fun and full of excitement. 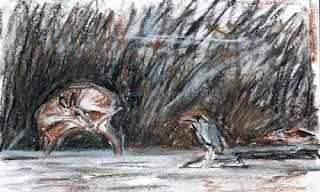 When I turned to wildlife art for my own subject matter I was hesitant because that sense of excitement seemed missing most of the time in the work that I saw. That changed when I first read Drawing Birds by John Busby. I was reminded it of this again when I saw an announcement for some David Measures exhibitions at the Society of Wildlife Artists web site. Other artists have suggested that I turn my love of dragonflies into work from life. But how? They seem even more active than birds. The David Measures work shown in the link gives the answer, and captures all the excitement of seeing dragonflies on a sunny day. I wish I were showing in the Annual Exhibition of the SWLA this year. Work was due for the jurying over a week ago. But I didn't apply. Much as I'd like to be in it the extra fees required to have a courier store it and deliver it to the Mall Galleries in London on a specific date was prohibitively expensive. That's not to mention the costs of shipping the work itself. I paid all of these fees last year but even if I'd sold everything I probably would have lost money. And I didn't sell anything. And then there is the morass of customs. I'd resigned myself to not showing this year and wasn't going to write anything about it. But seeing that announcement for the David Measures show reminded me of how appealing it is to show there with artists like the late David Measures. Rusty Blackbird and Carolina Wren. Reduction Lino with second lino block by Ken Januski. Barring a few little green tidbits here and there I think this lino is done. I know I'M done! 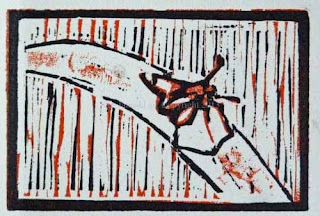 It's always amazing to me how draining these reduction linocuts, especially when combined with another block, can be. I read of another wildlife printer saying in Wildlife in Printmaking that it was best to stay away from him on the day he printed an edition. That rang very true to my experience. There are just so many things to keep track of and so many things that can go wrong. 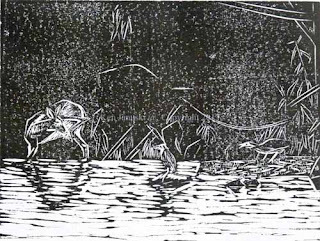 On the other hand I recently hung some of my linos in our bedroom and my wife Jerene was saying the other day how much she enjoyed just looking at the abstract qualities of the Green Heron and Twelve-spotted Skimmer lino. That's exactly the type of reaction I'd like. And it's one that I generally come to myself. It can just take awhile! Because this is such a dark lino, intentionally, it was hard to photograph. The photos came out too bright and with too much contrast so I doctored them on the computer to make the photo a bit darker. I don't normally do this. But I think this does give a truer indication of what the print actually looks like. I am happy by the way that it indicates the rich, almost iridescent colors of the Rusty Blackbird. I'm also happy that this began as a sketch from memory after coming home from seeing the Rusty Blackbird last January or February. Often these sketches aren't great. They would never work as finished works. But they are the first step in articulating an experience. It's always very satisfying when a finished work like this results from it. 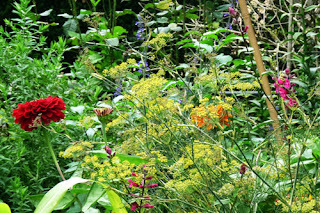 Benary's Giant Zinnias, Bronze Fennel, 'Mulberry Jam' Salvia. Every once in awhile I, and this time my wife Jerene as well, are just dumbstruck by the beauty of something in our garden. The last few days it's been the scene above of various Benary's Giant Zinnia, Bronze Fennel and 'Mulberry Jam' Salvia. 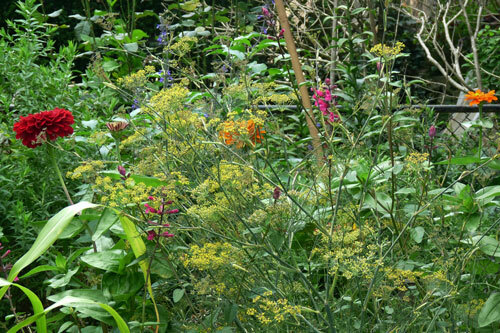 Often behind the scene is another blue salvia and a few other plants including the wonderful leaves of broom corn. The scene is beautiful enough in and of itself but it's even more fascinating when the flowers are covered with bees, wasps, flies and butterflies. Scolid Wasps on Mountain Mint. 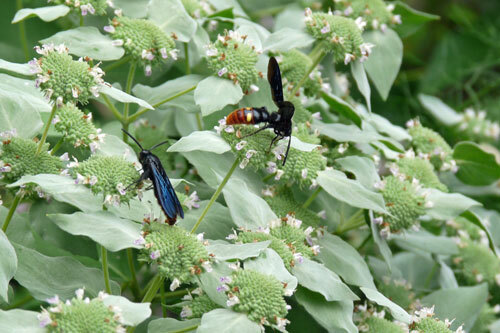 In particular it's the Mountain Mint, shown above, with two Scolid Wasps, that is just full of bees, wasps, flies and sometimes butterflies. We've found that whenever we have grown this plant that is just full of the most fascinating and beautiful flying fauna. I suppose if you're allergic to or scared of bees and wasps this doesn't sound too appealing. But we've rarely been stung, in fact never by anything on these plants, and instead just love to watch them. As I've also sketched insects on and off for many years that makes the plants even more attractive. 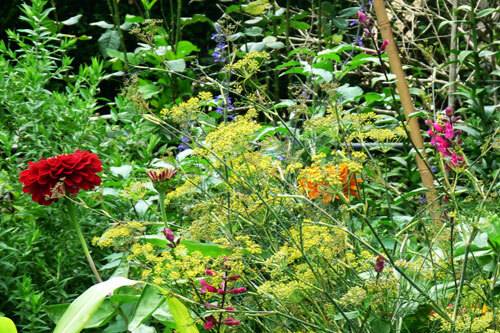 We have a very small garden, though it might be relatively large for the average big city garden. But it is an amazing microcosm of the world. Yesterday I watched a Carolina Wren go after a garden spider, itself waiting to go after whatever it caught in its web. As I said a microcosm of the world and endlessly fascinating. Preening Green Heron, Red-tailed Hawk, Belted Kingfisher. 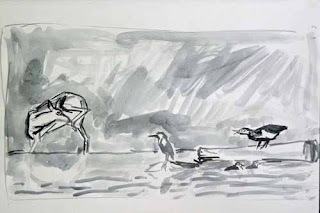 Field Sketches by Ken Januski. 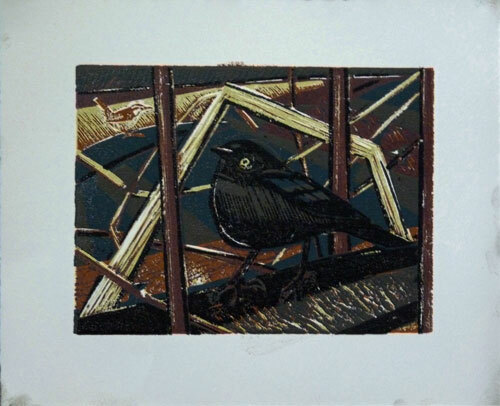 I had hoped to finish the Rusty Blackbird lino this weekend but I haven't touched it. 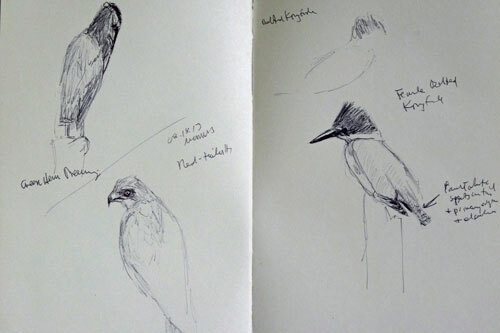 Once people start reporting seeing migrants I remember all that I've seen in August and have a hard time resisting spending some time birding and sketching at places that hosted these migrants. The most interesting bird from my visits to Morris Arboretum over the last two days was an Osprey. To me it's very early to be seeing ospreys but I do know that they've already been reported on some hawk watches. The birds I've been able to sketch through my spotting scope the last two days include a mature Red-tailed Hawk and a female Belted Kingfisher along with a preening Green Heron. Unfortunately the latter moved before I could finish the pose. I think my best art work is always precipitated by something I've seen in the field. So I never consider these sketching trips to be a waste or as procrastination from work in the studio. They instead fill up the reservoir of my imagination. And it is fun. P.S. I don't think we'd ever willingly buy something called 'Mulberry Jam.' But when I asked for salvia recommendations for hummingbirds at The Henry Foundation during their annual spring plant sale this was their recommendation. It's been a beautiful plant and one that does attract hummingbirds, just in time in fact as the Monarda is fully done and the Honeysuckle seems to be on its last legs. Rusty Blackbird and Carolina Wren. 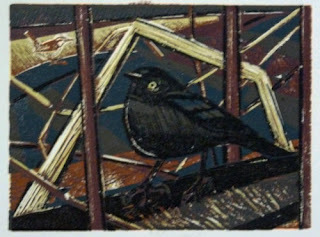 Multi-block reduction linocut trial proof by Ken Januski. Oops, I lied the other day. I thought I'd already printed four colors on the reduction lino block but had only printed three. I think I might have been confused by the other black lino block. In any case today I printed the real fourth color. This is the print as it looks so far on good Rives Heavyweight paper. Just one or two more colors here and then overprinting with the black block. As usual by this time I'm beginning to get a bit exhausted by this. On the other hand I'm also pleased with the way it looks. Hopefully it will be done by the end of the weekend. I'll most likely jinx myself by saying this but so far this lino is going pretty much as I planned it, way back in January or February when I did the first watercolor of the scene. The newest color is the deep burgundy of the vertical Poke stalks. It's a bit darker than I intended but that may change with the addition of other colors. On the ink slab it was a purple that looked like it could just never work. There are still all sorts of things that can go wrong with this print and that seems always the case with reduction linos, especially ones that use more than one block. But they also allow for some pretty rich colors and that's one of the things that I'm going for here. I'm sure that the biggest problem will be when I print the black block. Most likely I'll try a proof tomorrow to get some idea as to just how it will look once the black is added. Many printmakers talk about the surprise of the process. And that's exactly what I look forward to once I proof the black. What will it look like? Better than I ever could have envisioned? Or much more likely, telling me I have a lot of repairs ahead. Carolina Wren. Pencil sketch in Stillman and Birn Gamma sketchbook by Ken Januski. Rusty Blackbird with Carolina Wren. Reduction linocut trial proof by Ken Januski. It's hard for me to believe that I last touched the Rusty Blackbird and Carolina Wren reduction linocut more than two weeks ago. 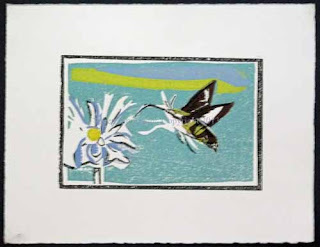 But that simple print of the Hummingbird Clearwing Moth turned out to be not so simple and so time just disappeared. One thing I did know is that the horrible version of a Carolina Wren in the black proof from two weeks ago would have to go. I wasn't worried though because it was just a placeholder on the black linoleum block. I actually planned to cut out the shape and print it on a second linoleum block. Though I was happy with the shape in the original sketch from early this year I decided it might be wise to do another pencil sketch based on it but with an additional look at my photos. That's it at top, done on Stillman and Birn Gamma paper. I do love this paper for the way it handles erasures and reworking in pencil. This is 5"x7" paper. On the print though the wren is less that 1.5"x1.5". So I made a smaller copy on the computer, reversed it, and then used tracing paper to draw it on the second linoleum block. At that small size I couldn't control the chisels and gouges for cutting away the lino as well as I'd like. But it was good enough. Above you see the second block with two colors, the yellow of some bent weeds and the brown of the Carolina Wren. The tall vertical weeds, actually Pokeweed, I hope to make a deep burgundy. After that some more browns and perhaps blue/blacks. Then finally the black lino printed on top of it all. At that point it will be time to evaluate the results, see what emergency has arisen, and I'm sure one will arise, and then decide where to go from there. I always envisioned this as a dark but rich scene, whether in watercolor on relief print, due to the dark rich colors of the Rusty Blackbird. So far that seems to be working out. Oh yes - Rusty Blackbirds don't really have eyes the size of quarters. It will become smaller once overprinted in black. Studio Model at Berkeley. 18x23. Acrylic on Paper by Ken Januski. I've been rearranging my studio the last few days trying to make it more organized and give me a bit more space. Of course in doing so I've run across some old, and very old, sketches, sketchbooks and paintings. I'm a bit reluctant to show much of this, mainly because I think items of historical interest are primarily interesting to the person involved and much, much less so to anyone else. But since I sometimes use this blog to explain, or try to explain, some of my artistic thoughts and motivations I occasionally find something from the past that helps in that effort. Among this morning's findings were quotes from the great American artist, and one time artistic idol of mine, Stuart Davis about how his work avoided the singular focus of much European art in favor of a type of painting that had its interest all over the canvas. I copied out pages of his thoughts on art and I won't repeat them here. But it reminds me of how much my art has always had some sort of theoretical interest in it. As far as paintings with more than one foci I think that's still largely true of my work. I get very uneasy when there's just one thing to focus on. I don't know if this is good or bad, but it certainly is consistent. When I was living in San Francisco and Berkeley and studying art as undergraduate and graduate at UC Berkeley many years ago I was primarily an abstract artist. 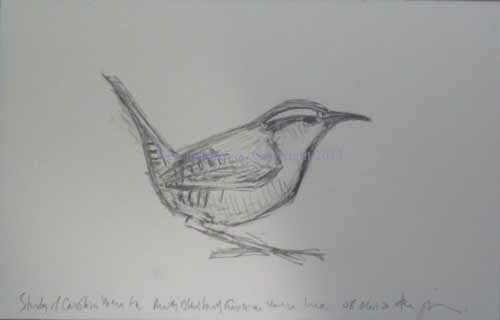 And I stayed that way until the 1990s when I started fiddling with insect drawings and then until 2006 when I switched completely to wildlife art, primarily bird art. But there were a few local giants in my San Francisco art universe at that time, Elmer Bischoff, in whose class the above painting was done, and former San Francisco resident Richard Diebenkorn. Their use of values, particularly in the interest of depicting light, were just irresistible. Though it's been many a year since I've lived in California with its extraordinary light I don't think I've ever lost my love of it, or at least my memory of what it was like. And their figure drawings were amazing, thoroughly of the 20th century and not some older academy. One of the things I loved about this painting in the past and then again when I saw it for the first time in 5-10 years today is its sense of light. At the time I'm sure it looked like nothing more than a Bay Area Figurative adoring copy. It probably was. But some things deserve to be paid that type of respect. In any case I only show this as an example of a quasi-realistic painting of mine that is more than 30 years old. I don't think I did any more in the next 30 years until I did a few small bird acrylics over the last couple of years. To me it's interesting that I was doing this type of painting while also fully engaged with the brash abstraction of Stuart Davis. But I think that's how good art is formed, through the influence of many, often quite disparate influences. 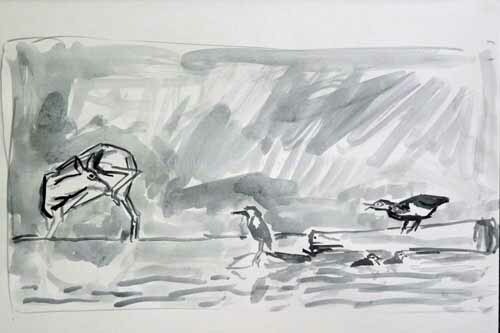 I do wish though I could look at wildlife art today and see more that is aware of people like Davis and Diebenkorn. 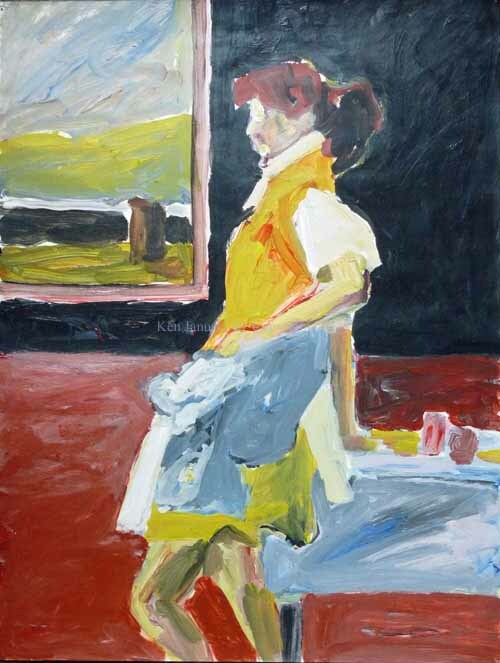 One of the most striking finds in my reading of a recent book on wildlife artist Bob Kuhn was that on his studio wall he had reproductions of the work of both Davis and Diebenkorn. Amazing and inspiring! P.S. I'd feel remiss if I didn't mention another influence, at least in terms of color from Berkeley: David Simpson. David was a friend and teacher of that time, one who stuck to his guns with simple geometric lushly colorful paintings regardless of where the whims of artistic taste might go. His paintings always proved that a very strong painting could be made almost entirely of color. Hummingbird Clearwing Moth at Flower. 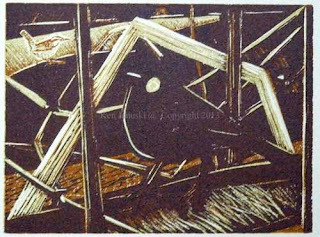 Linocut and Reduction Woodcuts by Ken Januski. 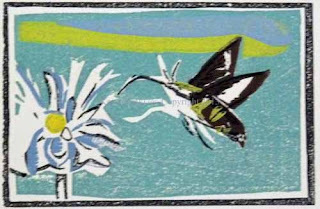 Way back when, a week or so ago, when I decided to do a simple black linocut of a Hummingbird Moth while waiting to start a more complicated print of a Rusty Blackbird and Carolina Wren I had no idea what I was getting myself into. I didn't have enough paper to start the more complicated print so I thought I could whip out this simple one in the meantime. It should be fun. Hmmm. Well it was fun to start, so much so that I foolishly labeled the last post Humming Along, to indicate how well things were going. But I finally decided to remove the complex hatching that formed the background of the linocut. Once I did the flowers lost all definition. And even though I added two different browns to the moth it just looked dull as dishwater. 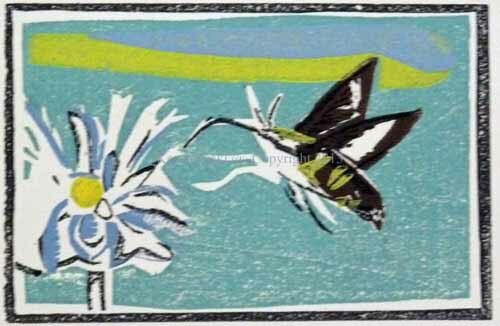 Over the last three days or so I decided I needed a second woodblock to add some yellow to the moth and perhaps add color to the flower as well. Along the way that cloud-like shape insisted on making an appearance. Finally today I finished it. That's a photo of the image itself above. Immediately above is the full print, with a 1.5 inch border on each side. It's an edition of 12 printed by hand on Rives Heavyweight paper using Gamblin oil-based inks. If you were to have watched the entire progress of this print you might have said: he doesn't seem to know what he wants out of it. I think that's true. But there's also the matter of having a dialog with prints, often forced on you by the prints, whether you want it or not. That was the case here. Eventually this print became much more about the softer colors and shapes that Shina plywood seems to favor and less about the harder shapes and colors that I often use in my linocuts. It also became more about abstract shapes and less about a lot of lines and marks, many of which help to define the form. Here, you can see I eventually decided that what I cared most about was the abstract combination of colors, shape and lines. All in all I think that's really my true artistic predilection. That's no surprise given my abstract background. But I think this may be my most abstract print. I hope you like it. Linoleum Block with two Shina Plywood Wood Blocks. Above are the three blocks I used in their final state. At the left is the linoleum block. I first cut out black lines in it to define most all of the shapes in the print. I them copied the resulting print onto the middle block, a piece of Shina plywood, to serve as a guide. 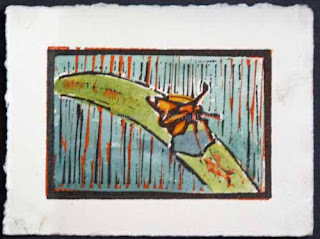 I used it to print, first the background in blue-green and then having cut away that just the brown of the moth. Later I added a second brown when I found I didn't like the first. I printed the blue-green and brown on good printing paper. But when I printed the black from the first block on top of it I just didn't like it. It seemed lifeless. So I once again copied the black onto another woodblock, the one at right, and started carving it. 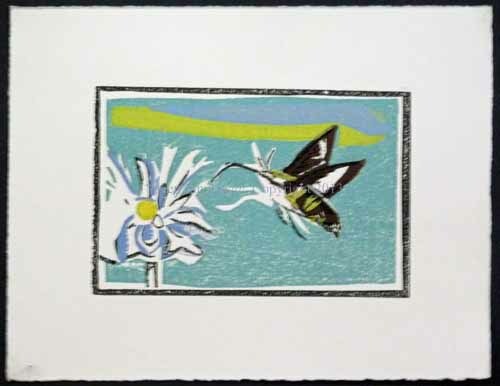 I only wanted it to print a few colors, the yellow marks on the moth and probably a blue or lilac for the flowers. That meant cutting away most of the block first so those areas didn't print. As I tested the yellow though I found that I liked the idea of leaving some of it in the background. Thus appeared the cloud-like shape. Once I was satisfied with the yellow I cut most of it away and kept cutting more and more of the flower away until I had just enough to help add definition. Once again though I couldn't resist trying a bit of lilac on the cloud shape. And that's where it ended. Above you can also see some of the tools that I use in cutting the plywood and lino. An antique, backwards way to get things done you might say, but one that I'm coming to greatly enjoy. Well at least at the end when the print is done.